Congratulations to "Bn100" the winner of Terry's giveaway. Thank you to all who participated. After I finished writing my first novel, FINDING SARAH, and well before it was published, I set out to make sure I could write more than one book. Aptly enough, I called it STARTING OVER, since that's what I was doing. It turned out to be an appropriate title—the only one I haven't agonized over! One of the secondary characters in Finding Sarah seemed to have a story, even though she'd only appeared in a few scenes in the book. I decided that it wasn't fair to keep bothering my sister-in-law, who lived in central Oregon, which was where Finding Sarah was set whenever I needed details about weather, trees, police uniforms—you name it. (I strive for accuracy, even in made-up towns!). I decided Colleen McDonald would move from Pine Hills to Orlando, where I lived. I sold the book, but when the publisher cancelled that imprint, I got my rights back. I thought I'd try it with another e-publisher. Given that I had to sever ties to the other books in the series, I rewrote sections of the book so Colleen no longer came from Pine Hills. We also changed the title from STARTING OVER to NOWHERE TO HIDE—which challenged both myself and my editor—I'd already come up with a title for the book, so a new one was worse that coming up with a title for a totally new book. Sales were sluggish with that publisher, so earlier this year I once again requested the rights, and decided to revamp the book and publish it myself as a Pine Hills spinoff. The beauty of indie publishing is that we can keep our books alive. Colleen's connection to Pine Hills was reinstated, and a new prologue connected the book to Randy and Sarah as well. If you'd like to read the prologue, you can find it here. I kept the title, Nowhere to Hide, because there are still print copies of the original version, and I didn't want readers to think they were getting a totally different book. 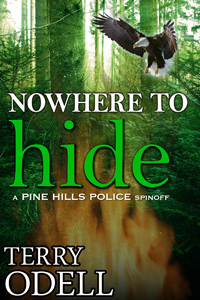 But I did get a new cover that ties into my other Pine Hills titles. So, is the third time the charm? I certainly hope so! What do you think about authors being able to re-release older books? Have you found any 'new-to-you' authors this way? Any newly discovered books that you might never have read unless you chanced upon them in a used book store? I'll give a copy of FINDING SARAH to one commenter. Giveaway ends 11:59pm EST Sep. 25th. Please supply your email in the post. You may use spaces or full text for security. (ex. jsmith at gmail dot com) If you do not wish to supply your email, or have trouble posting, please email maureen@justromanticsuspense.com with a subject title of JRS GIVEAWAY to be entered in the current giveaway. I'm a big fan of authors being able to re-release older books-- especially in digital format! I'm a streaker (in the reading sense! mostly :P), so whenever I discover a new-to-me author I enjoy, I immediately go on a quest to consume his/her entire backlist. If the author has been writing for many years, some of those books may be really hard to find... and there's nothing worse for me than missing out on a book in a series I enjoy! Plus, with eBook re-releases, I don't have to worry about giving up my minuscule living space to my books :). The only caveat: making sure it's clear that the book is a re-release rather than a new release-- like Nora Roberts [or, rather, her publisher] does with the gazillion re-releases of her novels. Cris - thanks. Hope you'll check my titles out. I do try very hard to make it clear that although I might have "tweaked" a book before re-releasing it, it's been published before. Loved reading about the many lives of this book, Terry! I'm sure the 3rd time is the charm! I really like it when authors are given the opportunity to re-release older books. This is a way that I have found new to me authors... and yes, sometimes I discover a new to me author and have to go to used books in order to build a library of the older, out of print books. Thanks for the giveaway!! Norah - thanks. I'm another glommer. Lavender - I love that e-books so often save us from having to scour the used book stores for out of print or back list titles. I do believe that the third time will be the best one. The story sounds amazing and the cover is great. I'm getting this one. Congrats on your new re-release. I am also a big fan of putting a face lift to an old story and putting it back out there. I've found some great authors, that I follow now, that way. Lynda - thanks so much. Hope you enjoy meeting Colleen and Graham. I think my cover artist does a fantastic job. I think it's a good idea for authors to do this. I'm another person that likes it when authors re-release books and yes, I've found new authors that way. I'm not exactly sure if that is how I found you, but I did go out and 'glom' up all of your books once I did find you. And, I've read them all, some even twice. Please don't include me in the great giveaway. bn100 - Thanks for stopping by. Karen - I appreciate your glomming! Thanks. I love authors rereleasing books... gives us the chance to find and enjoy books we may have missed out on before. The only downside is when there is a title change and not knowing it... I try to double check and make sure I am not rebuying a book I may already have on hand. Thanks for sharing! Just realized these comments are threaded! Ah, well. Thanks, Colleen. Yes, I agree, it's only fair to readers to let them know when a book has been previously published, and if so, if there's been a title change. I do like reading author's backlists once I've discovered their work. I've found a lot of great books that way! Thanks so much Jemi. So glad you liked the book. I like authors releasing their books. I have missed some of their earlier books because I was way underage to read romance books. I also love it when the release of the books is priced lower than the original prices. I do discovered new authors that I haven't read. So it is a win-win for the authors and readers. Thanks for your comment. I agree; nobody loses. Since noticing that many of the "serial" books I have read recently are copyrighted by the publisher, I am very pro-author's rights to the work he/she created. You are a small business of your own, and no one else did the work for you. As an older reader, if I find an author that I enjoy, I too look for other books they wrote. Glad that resources are increasing so that ebooks are also loaned, since like many baby boomers, I stretch my dollars. You go Girl for taking what you have created back from someone who did not appreciate it~ Hope your self-publishing is successful! Will be keeping you on my radar! Pat, thanks. I'm about ready to publish my 11th book, and I'm doing better now than I did when my publishers controlled them. I think there are more options and choices for readers this way. foods cοoked in 2 weеks without diеting. kind. Hoωeveг, јust grab something unhеаlthy. factors that yοu remаіn young аnd the healthier meal choices.